Throughout the summer we had been preparing ourselves for Christopher starting “big school” at the beginning of September. Although he was only just 4 years old having had his birthday on 14th June, the local policy was to begin school attending mornings only until the start of the winter term at which point it extended into full days. We decided to have a week away during the holidays and travelled to Austria . We managed to have a good time although we noticed Christopher appeared a bit tired on occasions. There were a couple of “unexplained” bouts of sickness during the holidays which at the time we put down to “one of those things which children pick up and quickly get over”. Time would sadly present a different reason. The first day at school began with some photos to mark the occasion but even then, we had noticed a look of tiredness under his eyes and during the first couple of weeks of September, Christopher had starting being sick in the mornings. Just after waking he would become very quiet and floppy and then would retch horribly after which he appeared to be ok again. In addition to visits to the GP I had been to A&E at Frimley Park hospital several times to try to find an answer to this ever increasing problem. Each time I was sent off having been told that everything appeared to be fine – but it was clear to us that everything was far from fine. At the start of October a referral letter was sent from the surgery – for an appointment with a specialist at Frimley Park hospital but before this had reached the consultant’s desk, another visit to A& E had meant a chat with a doctor who picked up on the fact that Christopher had also mentioned headaches and she was concerned that there may have been something serious. We then met with the consultant on the children’s ward who agreed to have Christopher monitored overnight. As expected, the by now daily sickness occurred and still the doctors did not suspect anything more than a gastric problem. We were given some medication and dispatched back home. Of course, the medication prescribed did nothing. Days later it was back for further discussions with the paediatric team and a decision was made to carry out an ultrasound of the stomach and for Christopher to have a barium meal. The results of both of these proved negative. By now, the distress and worry at home was huge. Christopher had not managed to be at school a week without being off for visits to A&E , I had received calls from the school to say that he had been sick and needed to be collected and he was obviously becoming more and more tired as the weeks went by. Such was our concern and desperation to get to the bottom of what was to us a serious issue and one we were enormously worried about that we filmed the sickness to show to the consultant. There were yet more visits to the paediatric team at the hospital and eventually on Monday 23rd October, the first day of half term, we couldn’t deal with the stress and worry any more and insisted that if Frimley was unable to find out what the problem was then we should be referred to another specialist hospital. Before we could be moved on to another hospital, a last test had to be carried out – a scan to show that everything was ok with the brain. Of course, everything was far from ok and that afternoon standing in the corridor in the ward, we learnt the worst thing possible – our beautiful son had a brain tumour. Life was never to be the same again. Having been dealt the blow of the news, preparations were immediately made to blue light us to St George’s hospital in Tooting where Christopher was to undergo major surgery. Kevin came home to collect some clothes for all of us as we didn’t know how long we were likely to be at St George’s . He also brought Christopher’s Nanny and “Big Grandad” back to Frimley where they were able to see him one last time before he underwent horrific surgery which was to change our special and beautiful little boy for ever. 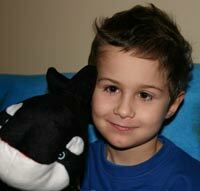 Christopher woke from his bed in Ocean Ward with a statement that he was feeling “fine”. (He had been given some anti emetic drugs to help prevent the sickness he was suffering – a common symptom.) Sensing what an awful day ahead it was likely to be, this turned my stomach as the poor little thing had no idea what lay ahead for him and neither did we looking back. The first stage on this particular day was an MRI scan to determine the extent of the tumour and to see if it had spread. Mr Marsh, the surgeon rang after 40 minutes or so after the anaesthetic had been given to inform us that there was indeed a spread of tumour into Christopher’s spine. Another blow…. Surgery commenced and after 6 hours or so pacing the streets of Tooting on a wet, miserable day we received a call saying that Christopher had come through the operation and we could go to see him in PICU (intensive care). It was with great apprehension we ventured into the room as I have to admit, I was scared at what we were going to find. The only words Christopher spoke were “I want to go home” which of course broke our hearts as it was beyond our control to do be able to whisk him back home. He was then unable to speak for several months due to the effects of surgery. The next days were tough to say the least – to see your child incapable of anything but thrashing around aimlessly with monitors bleeping every so often is a frightening experience. Painkiller doses were increased as they appeared not to have any sedative effect, an EVD drain had been fitted into Christopher’s head to prevent a pressure build up of fluid in the brain, an NG tube was inserted through the nose into the stomach for feeding purposes. It was tragic to see our son look as helpless as he did. Over the next days there were complications and infections to deal with – the stitches around the drain sight had become infected following leakage. Two stitches were then administered to the head with no anaesthetic late one evening on the ward – I have never seen such terror in anyone’s face before and had it been possible, we would have taken Christopher’s place time and time again to take away his suffering. On 6th November having noticed a bump from the burr hole in Christopher’s head increasing in size , a decision was made to operate again to drain this hygroma to remove the build up of CSF (cerebo spinal fluid). Having previously pierced the hygroma, the hope was that it would be ok for some time, but unfortunately it wasn’t the case. Three days later there was again an increase in pressure. On 10th November a CT scan showed enlarged ventricles due to hydrocephalus. There was a problem with operating to put in a permanent shunt as Christopher still had an infection which hadn’t completely cleared, thus a decision was made to put back a temporary drain. The whole day from 8 o’clock in the morning had been one stressful wait with an eventual anaesthetic at 6.30 in the evening. Christopher was returned to the neuro recovery ward at 11.30 in the evening- with yet another tube, this time protruding from another place in his neck. We asked ourselves how much more could be tolerated in terms of pain and suffering. There were more operations to come…. On 15th November Christopher was booked to have a shunt put in and also a Hickman line for chemotherapy. It was another day where we had to see our son “go off to sleep” and then hope and pray he would survive the surgery. Although we had experienced this a few times already, it was no easier to say “Bye, see you later”. I think each time we cried – with fear and sadness, but still with hope that things would turn out for the good. Throughout all of this time there was constant sickness despite anti sickness drugs being administered. More often than not, the NG tube would be sicked up and then had to be replaced – another gut wrenching and painful torment to go through for all concerned. If only we could have stepped in to replace Christopher with just some of what he had to endure… Diarrhoea was the next item to deal with – to such an extent that Christopher became dehydrated and showed an intolerance to the most pre-digested liquid feed. Eventually it as decided that the only solution was to use TPN (total parential nutrition). This is given intravenously when the stomach is unable to tolerate anything at all due its being damaged. It was unclear whether the damage was due to strong antbiotics, chemotherapy….What was clear was that something was needed to replace the lost fluids. Following 9 days of chronic diarrhoea, there had been a good night. This day also heralded the first smile and giggle that Christopher had been able to manage since 25th October, the day of major surgery. It was such an unbelievable joy to witness after everything that had happened to Christopher. There really is something so special about children and their ability to see beyond pain and suffering and to focus on the positive. This day marked a day trip to the Royal Marsden Hospital for tests prior to starting the proper chemotherapy regimen the following day. Whilst at St George’s a “holding dose” had been started as a CT scan had shown the tumours were still spreading and at a higher end of the scale. The tests involved a radioactive chemical being put into Christopher’s Hickman line and then traced by 2 hourly blood tests to ascertain how long it took the kidneys to deal with the substance. Christopher coped remarkably well and he seemed motivated by the new surroundings and playroom where there were some Thunderbird toys. On 7th December after 61/2 weeks we moved hospitals and straightaway that day Christopher embarked on the most horrific of chemotherapy regimes. There were 5 cycles with cycles 1 and 3 being the toughest and the same and 2 and 4 being the same, all over a period of about 6 months assuming he recovered sufficiently from each cycle and was well enough to commence the next. He was given cocktails of cisplatin, etoposide, cyclophoshamide, high dose methotrexate, all of which made him incredibly sick, lethergic and caused his hair to fall out. There were days and nights where we lost count of the number of times he was sick or had diarrhoea. One of the drugs was known to cause a hearing deficit and we were informed that this was a likely side effect of the drug. What were we to do – try to save our son’s life using the only known drugs and run the risk of permanent damage to some of the nerves within the ears or risk his not surviving? These are the sorts of decisions a parent should never have to confront, but for us it was the reality. Ten days later, as predicted by the Consultant Christopher’s blood count had dropped to 0 and he had mucocitis from the chemotherapy drugs. The stomach lining was badly damaged and he needed morphine for the pain. He also had an infection, par for the course and was prescribed strong antbiotics. The next days the situation worsened and stridor developed and there was concern about his breathing. We were taken by ambulance to intensive care back to St George’s so Christopher could be better monitored. After 3 days and nights spent at St George’s we returned to The Marsden and it looked as if Christmas would be spent there. On Wednesday 27th December we were allowed to go home – the first time in 9 1/2 weeks. We were all relieved to be home but there was a sense of upset and frustration from Christopher – perhaps he thought he would be able to walk and talk and feel no discomfort and that everything would be as before – sadly for all of us, this wasn’t the case. It was good to be out of hospital but being at home brought with it it’s own challenges – Christopher needed someone to be present constantly as he was unable to sit unaided. He would roll if left on the settee as he was no longer strong enough to sit alone. Our stay at home was short lived and we returned to The Marsden on 1st January. This time for harvesting of stem cells – another horrendous time as another operation had to be performed to insert a vascath from which the stem cells would be harvested. At least the harvesting was a success and Christopher obtained a “7” which was an excellent result. it was back home for 4 days before we then had to go to St George’s for yet more surgery. As Christopher’s treatment was so intensive and nausea inducing, a decision had been made to insert a gastrostemy into his stomach to avoid the use of an NG tube. Another horror to face and more surgery to our beautiful little boy. Again, we felt there was little in the way of choices…. After hours of waiting in the ward the operation was carried out and the following day we statred to use the PEG tube to feed Christopher. All appeared ok until about 2am when we learnt he had a temperature. Later in the day antibiotics were started for a suspected bug and we were moved to a separate room. The next day, although the temperature was still spiking we were allowed to go the Marsden to collect cycle 2 chemotherapy drugs. The doctors at the Marsden were not happy for the 2nd cycle of chemotherapy to begin until the temperature had stabilised. We had then to wait until 4.30 in the afternoon until a bed was confirmed as available at Frimley Park hospital for us for that same night. We ended up with one hour at home to collect overnight things and then went to Frimley hospital where Christopher’s temperature could be monitored and IV antibiotics started.Three hospitals in one day was about the limit for the nerves to endure – our lives were not ours any more and we had just to succumb to what was being advised in the interest of trying to help save Christopher from this awful disease. We took turns to stay overnight at Frimley hospital for about a week whilst the antibiotics continued, a second one having been started as well – days all together and then alternate nights in the room with Christopher and one of us at home trying to get some sort of sleep. We were allowed out to collect etoposide and temozolomide from the Marsden and another day out to have vincristin administered. The start of more chemotherapy meant for Christopher almost incessant vomiting even with the antiemetic drugs which were given in tandem. We would have given anything to step in to Christopher’s place – not to have seen him suffer every step of the way, never once complaining. I don’t know if there can be much in life that is worse than seeing a child with cancer and then having no alternative to save their life other than treating them with these dreadful poisons. Having somehow got through cycle 2 followed by a blood transfusion involving 51/2 hours at Frimley hospital again, we started the dreaded cycle 3 with it’s horrific drugs: cisplatin which could cause a permanent hearing deficit (and did so), methotrexate which could potentially cause kidney damage….As a parent there is no choice – you want only to save your child but there are such huge side effects with these drugs, that the choices leave no real winners. We battled through the cycle and returned home to await the deterioration post cycle – sickness and diarrhoea and concern about dehydration. Then it was off to Frimley hospital as Christopher had a temperature. Two antibiotics were started and after 48 hours of no improvement a third was added. There were several awful days and nights with sickness, diarrhoea and mucocitis affecting the lower stomach. In order to rest his gut, Christopher was fed intravenously. After 10 days we could return home. Some of cycle 4 was at the Marsden – 21/2 days for cyclophosphamide which seemed like a week and some of the drugs were given at home – it’s a tough call giving chemotherapy to your child knowing how awful the side effects are. The beginning of April saw the start of cycle 5 and another 6 days at the Marsden with a lot of sickness and Christopher being given Nosinan which sedated him and meant less discomfort. We spent a lot of time giving boluses of feed every half hour in the hope that it would stay down better. We left for home on Easter day and received a phone call from the Marsden after an hour of arriving back home that Christopher would need a blood transfusion. This meant going to Frimley hospital for a cross match so the transfusion could take place the following day. Although it was good to be at home it felt like we were haging off the edge of the cliff waiting for Christopher’s condition to worsen as a consequence of the chemotherapy. The next day was blood transfusion and the following day we knew we needed to get back to hospital with Christopher. He had been vomiting frequently since 4.15am and we were concerned again about dehydration and it was only a case of time before his temperature spiked. This time we stayed for 12 days and only had a week’s grace before the next MRI scan. The scan was as good as we could have hoped for – we were euphoric that this awful treatment appeared to have worked and destroyed the tumours – there was only one area on the lower spine that the radiologists would not confirm was not tumour but a spinal tap was to be carried out after high dose chemotherapy which was the next testing stage ahead of us. We arrived at the Marsden on 8th May and had been warned that at best we would be there for 5 weeks – and that it could easily extend to 8 weeks. Psychologically this was not easy to prepare for. Ten days later Christopher had his stem cells returned, his temperature went up, his mouth was sore and he couldn’t bear anything touching his swollen lips. Sickness and diarrhoea began in earnest and 4 antibiotics were now being given. He was given platelets and blood transfusions and in addition to vomiting mucous began to vomit stomach lining – this was a shock to see. By now he was receiving intravenous feed as his stomach lining had been completely destroyed. He needed IV morphine to ease the pain. He did miraculously (or so it seemed to us) recover from the awful side effects of the high dose chemotherapy and did so amazingly well. We were hoping to leave for home when we learnt he had shingles – this meant an additional week’s stay in confinement whilst he recovered from this. We returned home a week before Christopher’s 5th birthday. Another MRI scan at the end of July and a spinal tap brought the news we had hoped for – everything appeared to be clear so no more treatment was needed. During the summer Christopher had to learn to eat again and to build up strength. He had lots of fun sessions with Gail his physiotherapist and wanted more than anything to walk and play like all his friends. His hair bagan to grow back and he started to become stronger and returned to school in September. By the October half term he had begun to be sick again and a routime scan in November brought with it devastating news – the tumours were still there and had spread again. There was little that we could do at this point – we had looked forward to having Christopher’s Hickman line and gastrostemy removed, but we were having to pick ourselves up and face the reality that there was little anyone could do to prevent the cancer from taking over. We weren’t about to give up on our little boy and we trialled a biological drug, retinoic acid alongside etoposide to see if there would be a response. We battled on at home and in January a scan showed a positive response and tumour shrinkage. All the while apart from sickness, Christopher was seeming to gain strength and was starting to walk again – we were so pleased for him to be able to do this one thing again which meant so much to him. The end of April meant the next scan which showed the tumours had got their evil way again – Christopher had his first fit the day after the scan and we knew that the future was bleak. The treatments ceased and we had no option but to commence palliative care – something no parent should be faced with or have to go through. Even now it is unbearably painful to write this and commit these thoughts and feelings to words. In the end, on June 5th 2008 we had no choice but to give up our hopes of saving our beautiful little boy. Despite a brave, uncomplaining and courageous battle the cancer had won the day and took our son from us. We have to hope now that through our efforts we can make a difference for others and feel that Christopher did not endure the suffering and pain completely in vain. We will always hold dear our smiling wonderful little boy and although we will always harbour the pain that he is no longer here with us, we have to hold on to a new hope that cancer will not win future battles and that an effective cure will be found.